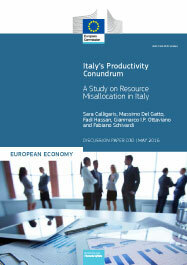 The study provides an assessment of resource misallocation in Italy and of its role in explaining the country's sluggish productivity growth since the early 1990s. Discussion Papers 30. May 2016. Brussels. PDF. 96pp. Tab. Graph. Ann. Bibliogr. Free.